OrchEstraCada is a multilevel orchestra for all ages, and many of our participants are families who want to make music together. We have beginners, advanced players and experienced music teachers. Our rehearsals are held in three stages. All musicians participate for the first hour, as we warm up and build skills with exercises and pieces written for multilevel orchestra. The first hour ends with time for advanced players to work one-on-one with students to check for understanding, technique, and performance readiness. Then the beginners leave and the rest of the orchestra settles in for rehearsals of more difficult pieces. Typically, beginners and intermediates are finished at 5:30, and advanced players are done at 6:30. Orchestra instruments include violin, viola, cello, bass, guitar, horns, flute, clarinet, piano, and percussion. In 2006, Estacada Together and the Estacada School District successfully applied for a Community Music Partnership with the Oregon Symphony. In the 2006-7 school year, the Oregon Symphony provided this small community with ensemble performances and workshops for the schools and the town, culminating in a joint performance with local musicians in the high school gymnasium. Suddenly, there was an interest in string instruments and orchestral music that needed an outlet. OrchEstraCada was formed to meet that need. For the 2007-8 year, the orchestra was part of the Estacada Community Schools. The following year, it was sponsored by Estacada Together, and began meeting in the Estacada Public Library Community Room. In 2012, OrchEstraCada began a collaboration with Estacada Web Academy (subsequently Summit Learning Charter) to offer school credit for students. It currently meets at the Eagle Creek Campus music room, provided by Estacada School District and Summit Learning Charter. Director Elaine Butler is a licensed teacher with Summit Learning Charter, and manages the Philip Foster Farm historic site on the Oregon Trail. She started performing as a vocal soloist at age four, started piano lessons at age 6, and began her violin and theory training at the Portland Community Music Center at age 8. Elaine teaches social studies and general music classes at Summit, and enjoys performing with church and community musicians. She and her husband, Mike, have six grown children, including licensed K-12 music teachers in Helix, Oregon and Lustre, Montana. 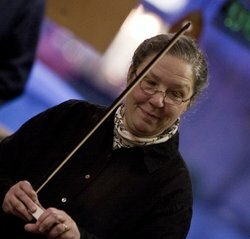 Claudia Zinser is a retired music teacher, and continues to maintain her license after teaching orchestra and general music classes in North Clackamas and Estacada school districts. She frequently plays at the Mossy Rock Jam on First Fridays in Estacada, and is an accomplished pairs skater with her husband, Jim. Claudia plays violin, cello, and viola. Doug Castle is a retired band director from Sandy, Oregon. He joined the orchestra to play with his wife LaDonna, his daughter and grandchildren, and currently mentors our cell0-bass section. David and Mary Reichert joined the orchestra with their three boys in 2017. David mentors percussionists, and Mary coaches our brass section.